Third M41 Delivery a Success, an M29 with twin TCM 825’s next in line, Horizon’s next M31 weeks from delivery, a wicked M35 with Mercury 1100’s just out of cut & buff. 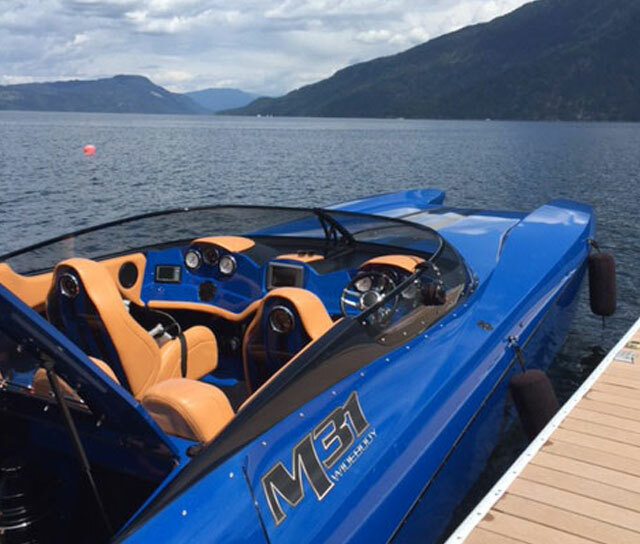 With its twin Mercury Racing 1350 engines humming, DCB’s third M41 Widebody catamaran performed flawlessly during its first water test on the Columbia River near its new owners’ Vancouver, Wash., residence on Monday. 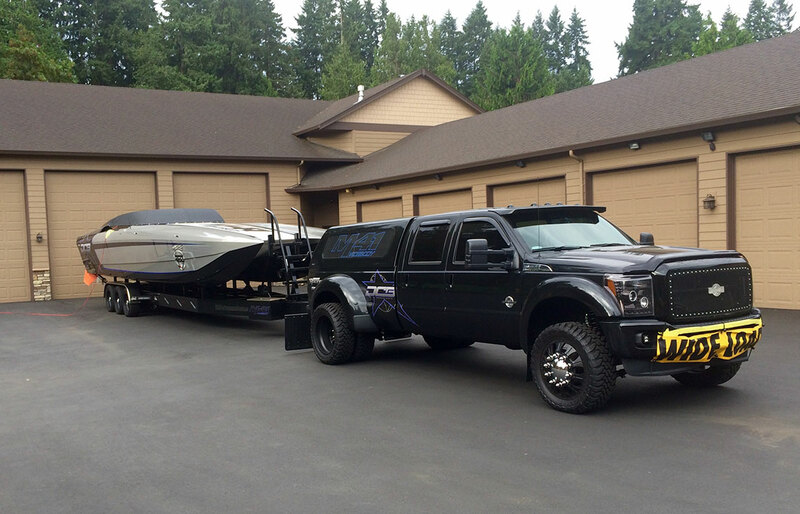 DCB’s Dave Hemmingson and Tony Chiaramonte spent two days with the first-time DCB customers as they took delivery of the stunning black, metallic grey and blue catamaran. 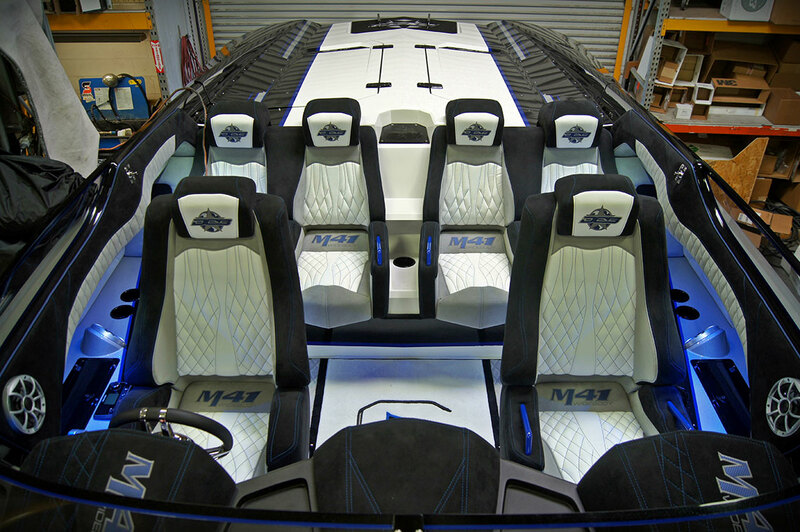 As expected, the over-the-top rigging and interior in the M41 amazed the happy Washington couple, which was also blown away by the construction quality of the blemish-free 41-footer. 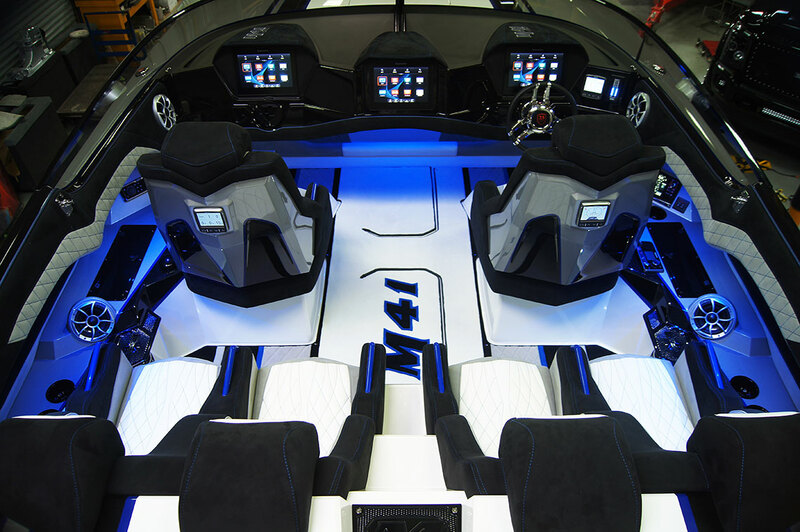 Next in line for delivery is DCB’s most powerful M29 to date featuring a pair of 825-hp Teague Custom Marine engines. 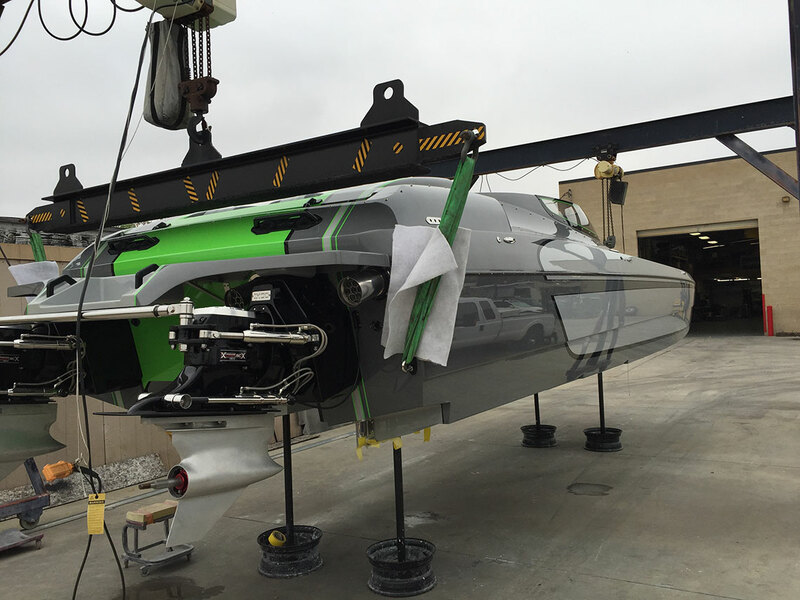 The open-bow 29-foot catamaran should be water tested and ready to hit the road in a couple of weeks with its eager owner awaiting its arrival in Wyoming. 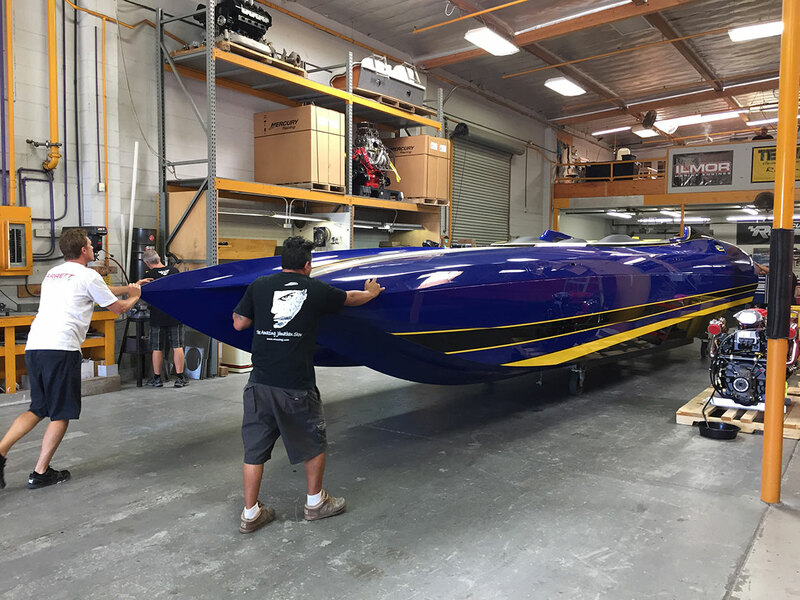 Right behind the M29, the first of two M31 Widebody catamarans with twin Mercury Racing 700SCi engines ordered by Preston Woolery of Horizon Motorsports is nearly complete as well. 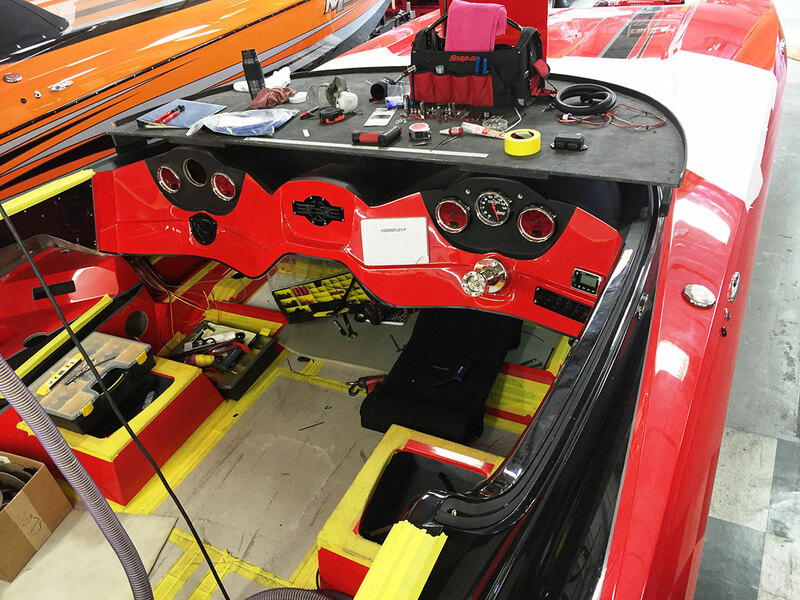 The red and black 31-footer is currently in the rigging bay and is scheduled for a late-August delivery. Woolery said he has some prospective buyers, so if you’re interested, contact him right away at 928-855-9555. Horizon Motorsports’ second one—a classy white M31— is out of the mold, and will be delivered sometime this fall. If interested, call Preston immediately, there’s still some time to customize your dash and interior options on this hot rod. 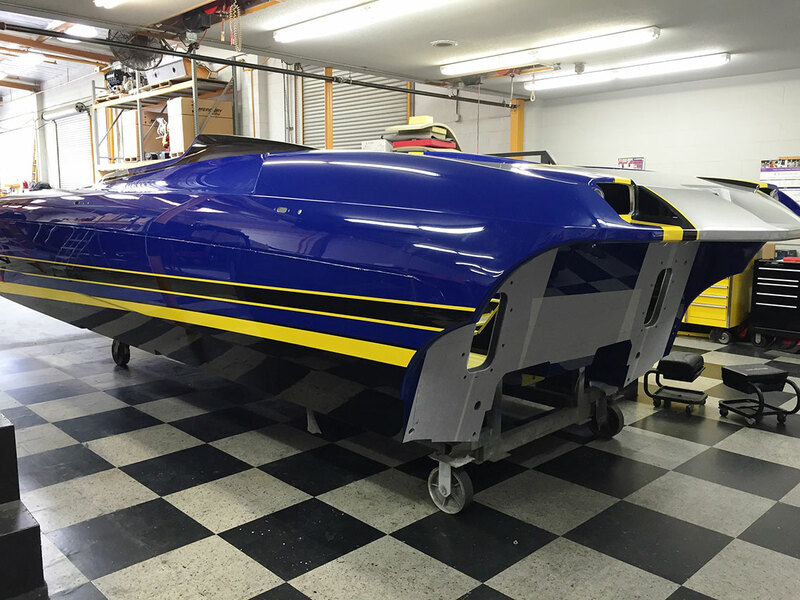 Just wrapping up in the cut and buff stage of the build process, the next M35 Widebody, which is getting twin Mercury Racing 1100 engines, is eight to 10 weeks away from delivery to its new owner in Alabama. This one is sure to be a stunner! 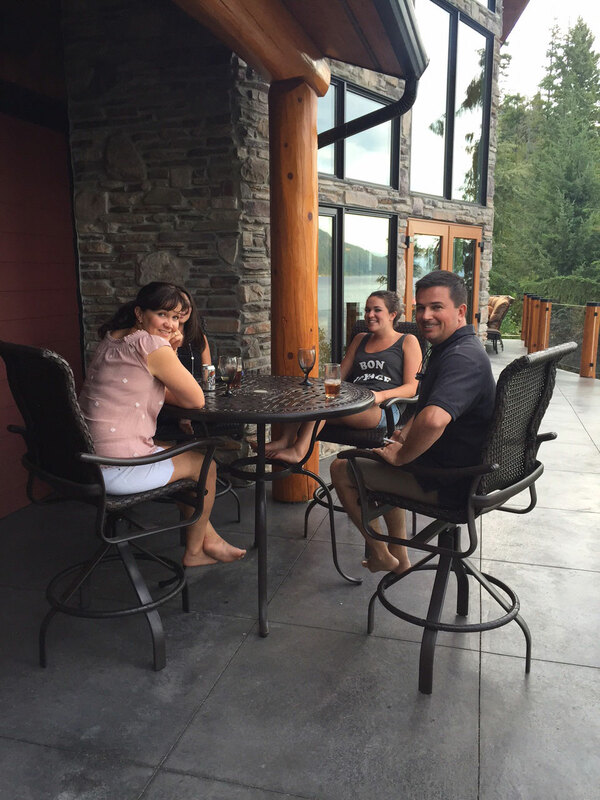 Owner Highlights: As many of you know, DCB is one big happy family without borders, which is why we encourage you to share your DCB-related experiences like longtime customer Brad Macaulay recently did. 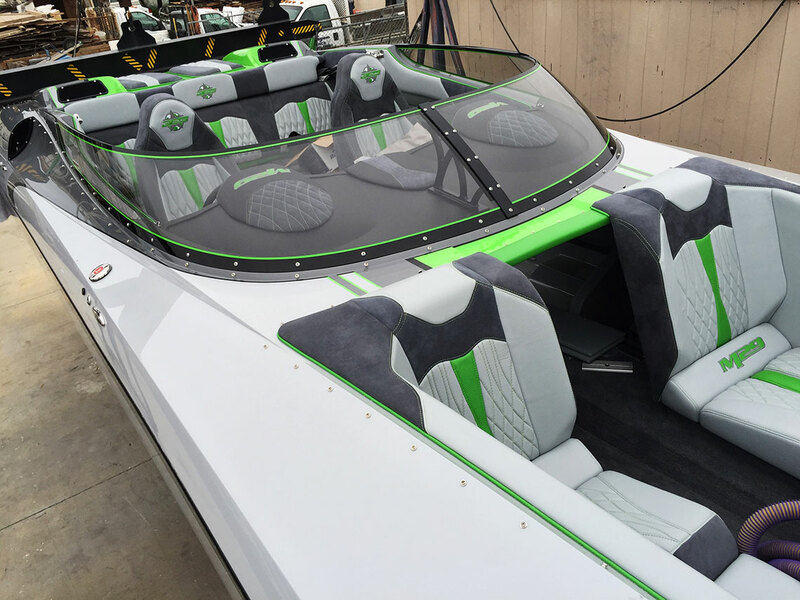 Macaulay typically comes down to all the Lake Havasu City, Ariz., events to boat with his fellow DCB buddies on their turf—the Colorado River. 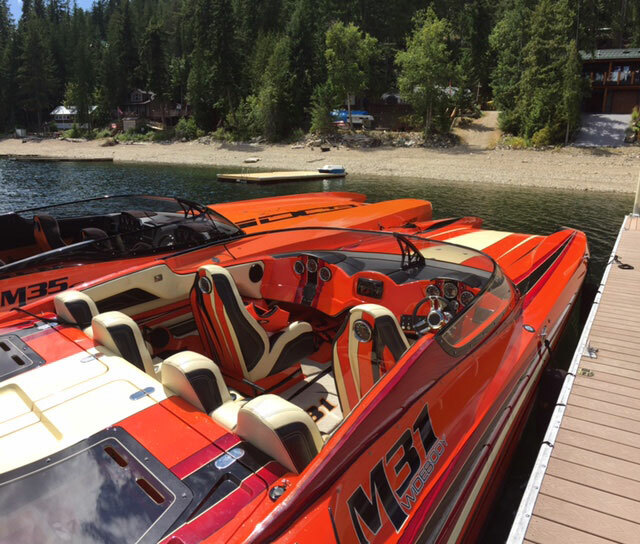 This year, he flipped the roles and invited eight of his closest DCB friends up to his neck of the woods to enjoy Canada’s Shuswap Lake. Joining Macaulay for five days at his cottage on the water were David Crow and Windy Burke of Farmington, N.M., in their M35, Chad and Diana Budge of Jackson, Wyo., in their M31, John and Yoon Chilton of Goodyear, Ariz., in their M35 and Dr. Steven Ossakow in his new M29. 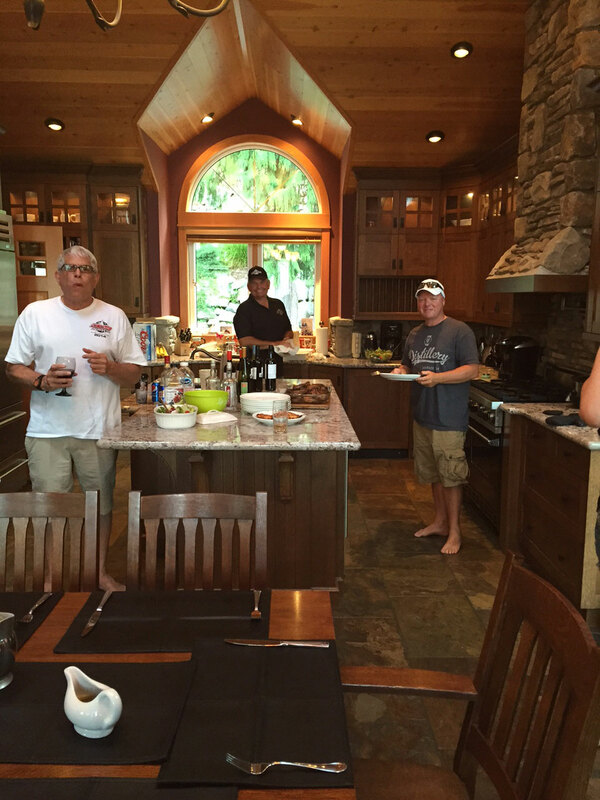 The event was capped off with a surprise barbecue hosted by DCB owner Rob Blair in his cottage down the river. Check out speedonthewater.com’s Image of the Week from the gathering. If you’re coming to Missouri’s Lake of the Ozarks in a few weeks, be sure to join DCB at the Lake of the Ozarks Shootout and Super Cat Fest (Aug. 27-30). Of course, the 25th Anniversary DCB Regatta is just around the corner (Sept. 25-27) in Lake Havasu City. Click here to sign up before it’s sold out. This is going to be a special celebration you won’t want to miss. Check back for another edition of Inside Out next month.